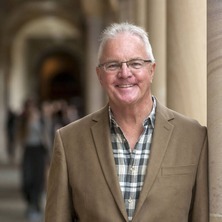 Associate Professor Richard Hutch is an Honorary Associate Professor and Reader in Religion and Psychological Studies in the School of Historical and Philosopical Inquiry. His research interests include psychology of religion, sport and spirituality, self-narrations and life-writing, and death and dying. TO NOTE: Richard Hutch presented the keynote address at a symposium on the American Civil Rights Movement held at Gettysburg College, Gettysburg, Pennsylvania, in the United States on the 150th anniversary of the end of the Civil War, 9 April 1865. It was also the 50th anniversary of the "Summer Community Organization and Political Education" project (SCOPE), which was sponsored by the Southern Christian Leadership Conference (SCLC), founded and led by Martin Luther King, Jr. Richard volunteered for the SCOPE project in rural counties in Alabama and Louisiana in the summer of 1965. The project spearheaded a massive voter registration drive throughout the South after "Bloody Sunday," the violent racial conflict that occurred at the beginning of the Selma to Montgomery march on March 7th that year. Through the efforts of SCOPE volunteers and others, who often faced life-threatening incidents of racial violence (as Richard himself did), the Voting Rights Act of 1965 was finally passed by the American Congress and signed by the President in August. The keynote address at Gettysburg College presented Richard's experiences in the South during his harrowing time there. He was honoured by his alma mater on the occasion with the establishment of an archive in his name in the Musselman Library at Gettysburg College, including the journal he kept during his summer in the South and other unique materials from the Civil Rights Movement. It can be noted at the town of Gettysburg was the site where the Civil War "Battle of Gettysburg" took place in July, 1863. Northern Union troops pushed the Southern Confederate troops from their so-called "high-water mark" back south across the Mason-Dixon Line (which separated "slave" states from "free" states, and was drawn on maps just beyond the southern border of the state of Pennsylvania near Gettysburg). The battle represented the beginning of the end of the Civil War, with the final defeat of the Confederacy by Abraham Lincoln's Union Army two years later on 9 April, 1865 at 3:15 in the afternoon, when church bells rang out throughout the North. Associate Professor Hutch was the Director of Studies for the Faculty of Arts (2001-05) and Head of the School of History, Philosophy, Religion and Classics (2005-08) at the University of Queensland. Before taking up his appointment at UQ in 1978, he was Assistant Professor of Religious Studies at Southern Illinois University in the United States (1974-78). He graduated from Gettysburg College (BA, 1967), Yale University (BD, 1970) and the University of Chicago (MA, 1971; PhD, 1974). Social justice and healthy living are marks of human morality, an often overlooked but central pillar of daily life. My work asks how a person can be a constructive force for personal growth and social change, this in spite of the fear many people have about imagining wider than usual horizons for living. Assertions of human morality go beyond entrenched views. Pursuing freedom and justice can move current issues forward, such as comtroversies about race, religion, sexuality, gender and ageing. Hutch, Richard (2016, October 20). Why sport is a spiritual experience – and failure can help. , . Hutch, Richard A. (2016). Converting mortal losses into vital gains – ‘Could be worse’.... In Rossano Zas Friz de Col (Ed. ), Transforming Spirituality: Celebrating the 25th Anniversary of 'Studies in Spirituality' (pp. 323-338) Leuven, Belgium. : Peeters Publishers. Hutch, Richard (2015). Attribution (Theory). In Segal, Robert A. and Stuckrad, Kocku von (Ed. ), Vocabulary for the Study of Religion (pp. 140-143) Leiden, Boston: Brill. Church Personnel Child Abuse in Child Welfare: Foucauldian Insights. The Continuums of Silence, Scandal, Response and Maintenance. Giving Rise to Continuum Theory, Child Welfare Continuum Theory. Hutch, Richard Sport as a spiritual practice: Mastery, failure, and transcendence in the life of athletes. Lewiston, NY, U.S.A.: Edwin Mellen Press, 2010. Hutch, R. A. Lone Sailors and Spirtual Insights: Cases of Sport and Peril at Sea 1 ed. New York: Edwin Mellen Press, 2005. Hutch, Richard A. The meaning of lives: biography, autobiography and the spiritual quest. London, UK: Cassell, 1997. Hutch, Richard A. (2012). Solo sailing as spiritual practice: A phenmenology of mastery and failure at sea. In Patrick Allen Goold (Ed. ), Sailing : Philosophy for everyone : Catching the drift of why we sail (pp. 36-46) Cichester, West Sussex: John Wiley and Sons. Hutch, R. A. (2003). Ralph Waldo Emerson (1803-1882). In Philip B. Dematteis and Leemon McHenry (Ed. ), Dictionary of Literary Biography. American Philosophers before 1950 (pp. 103-119) United States: Thompson Gale. Hutch, R. (2002). Heterosexuality. In Wesley Carr (Ed. ), SPCK Dictionary of Pastoral Studies (pp. 152) London: The Society for Promoting Christian Knowledge. Hutch, R. A. (2001). Beyond the Reach of a Miracle. In Jacob A. Belzen (Ed. ), Psychohistory in Psychology of Religion: Interdisciplinary Studies (pp. 113-136) Amsterdam - Atlanta GA: Rodopi. Hutch, R. A. (1999). Depersonalisation and the magic of deifying the body: Clinical notes on a political hostage. In J. A. Belzen and J. Corveleyn (Ed. ), Crossing the boundaries in psychology of religion: Case studies in cross-national and cross-denominational context Religionsvetenskapliga skrif2 ed. (pp. 61-80) Abo, Norway: Abo Akademis University. Hutch, Richard (2014) Oral history: Richard Hutch and the SCOPE Project, 1965, American Civil Rights Movement. Gettysburg, PA, USA, Gettysburg College. Hutch, Richard (2009) Sport, Sailing and Human Spirituality. Interface, Sport and Spirituality, 11 1: 101-130. Hutch, Richard (2009) Throttle up whirlwind: Space, time, and the sacred elixir of speed among recreational motorcyclists. International Journal Of Religion And Sport, 1 81-92. Hutch, Richard (2008) Sport and Faith. The Transit Lounge, 37: . Hutch, Richard (2007) Speed masters throttle up: space, time and the sacred journeys of recreational motorcyclists. International Journal of Motorcycle Studies, 3 2: 1-6. Hutch, R. A. (2005) Under sail alone at sea: A study of sport as spiritual practice. Australian Religion Studies Review, 18 1: 3-24. Mel Gibson's big punt: "The passion of Christ"
Hutch, Richard (2004) Mel Gibson's big punt: "The passion of Christ". Australian Religion Studies Review, 17 2: 117-119. Hutch, R. A. (2002) Review and Critique of Jesus. Pastoral Psychology, 50 6: 469-474. Hutch, R. A. (2001) Spiritual Autobiography as the Magical Deification of the Body. Soundings: An Interdisciplinary Journal, LXXXIV 1-2: 121-141. Character and cure: "Patient, heal thyself"
Hutch, R. A. (1999) Recasting the stone: Human suffering and the business of blame. Australian Religion Studies Review, 12 1: 107-108.